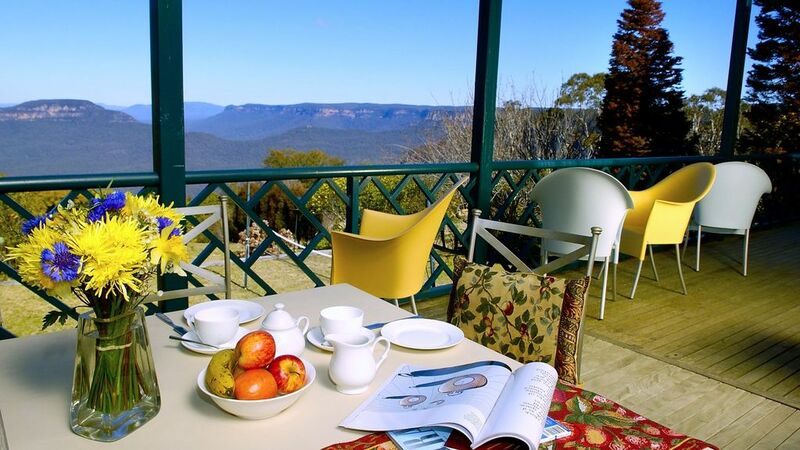 Rhapsody is a breathtaking getaway perched on the escarpment of the world heritage Blue Mountains. Designed by iconic architect, Philip Cox, this dress circle property offers travellers a haven with panoramic point blank "best views" in the mountains. Opening in March 2013, Rhapsody will feature amongst its distinctive makeovers, the handpainted French provincial kitchen graced by a Witch Hazel Corian benchtop with seamlessly integrated double sinks and unique Corian splashback. Savour the tranquility of the mountains in the privacy of your own exclusive home. A short stroll to Leura village, golfcourse and natural attractions, Rhapsody presents an ambience of captivating elegance. Enter Rhapsody, close the front door behind you and be transported to a world of beauty, relaxation and rejuvenation. Breakfast blissfully in the clouds. Brunch on the verandah and watch the mist lift revealing the drama of the inspirational cliffs. Enjoy grandstand views over magical dawns and dusks. Put your feet up and unwind in comfortable chairs by the inviting fire. Or, you can enjoy an invigorating game of volleyball, badminton or bocce (equipment provided) played against the majestic backdrop and explore the many walking tracks starting just 20m away. The Pool of Siloam Circuit, Lyre Bird Dell Round Walk, Golf Links Lookout, Prince Henry Cliff Walk and Gordon Falls. Return to relax and soak in the spa. A selection of the latest movies and optus Fetch and free WIFI awaits you. Sip cocktails and dine as you gaze at the silvery moonlight glistening on the midnight blue mountains....unforgettable moments cherished intimately with your partner or treasured warmly with your friends and family. Rhapsody is filled with elegant, contemporary furniture contrasted against handpicked antiques. French doors and picture windows take in stunning views of Mount Solitary, The Ruined Castle, The Three Sisters and the Jamieson Valley from most rooms. Two sumptuous king beds (one a king split), 1 queen bed, 2 single beds and a double sofa bed in 4 bedrooms, central heating, aromatherapy & L'Occitane toiletries, heated ensuite/ bathroom/ towel rail, library, fine indoor dining flowing on to awe-inspiring outdoor dining facilities, spacious entertainer's kitchen with European appliances, connosseur's stainless steel BBQ and pure cotton linen complete the luxurious amenities. In-house catering, massage and pampering are available upon request. Rhapsody is just a short stroll to the famous Leura heritage shopping village, renowned for its galleries, boutiques, decorator and antique shops, and the Mountains' finest restaurants. The Mountains' quaint and charming trams will transport you nostalgically on a tour of the townships and scenic spots. Adrenalin pumping adventures, horse riding, biking and mountain climbing are a phone call away. toilet, combination tub/shower, shower, jetted tub, Spabath in main bathroom. Frameless shower screens. One step from garden into front door. Flat access on ground floor to bedrooms, bathrooms, common areas and view deck with stupendous outlook to Three Sisters, cliffs and the forever blue-green azure. Perfect location. Amazing views from house. We really enjoyed our stay. Views from the back verandah are amazing, changing hourly with the movement of the day. Great location close the Leura mall as well as quick trip to Katoomba (3 sisters & sky world) and Wentworth Falls. House was clean and homely. Highly recommended. Immaculate home with magnificent views. We had a very enjoyable and comfortable two night stay. Location is perfect, not just for the views and quiet, but also for access to restaurants and places of interest. The premises were immaculate, welcoming and easy to live with which made everything feel like home. We cannot wait to come again. Great home away from home. Susie was most obliging and we were very comfortable with 10 people in the house. All appliances needed were available and in good condition. The BBQ was in need of a good clean - we did not use it. The mountain views and location were great. A wonderful home for a get together.